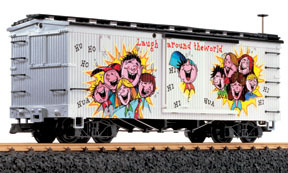 The Gb series of two-axle freight cars (Gb, Gbk and Gbk-v) were manufactured in large numbers and are still used on Switzerland's Rhätische Bahn. 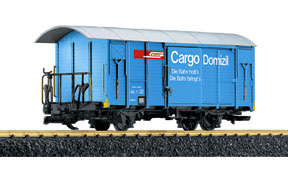 Now they often feature advertising, for example, for the Cargo Domizil package service. 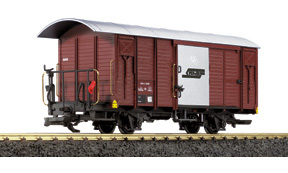 With this steel-style boxcar, LGB modelers can expand their rosters of equipment for this popular line. 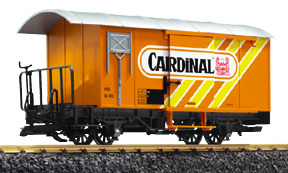 Decorated with the classic logo and colors of the Denver & Rio Grande Western, the model offers sliding side doors and metal wheel sets. Advertising cars are a frequent and popular sight on Swiss railways. This colorful car advertises a local beer and can be seen on the Montreux-Berner Oberlandbahn (MOB). These brown boxcars are a common sight on Switzerland’s Rhätische Bahn, but this one can be distinguished by the "Velo" advertising for the RhB’s bicycle portage service.